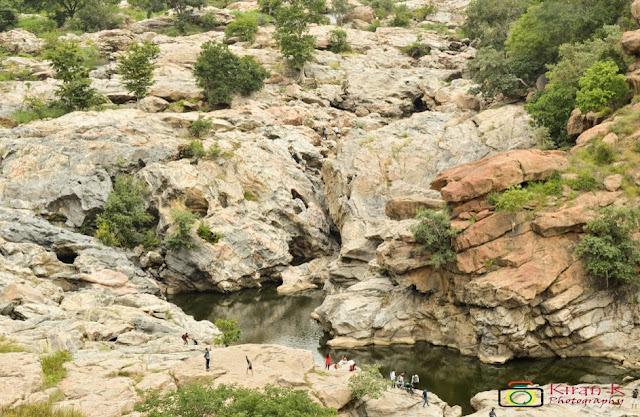 Chunchi Falls, located near the Kanakapura city, is one of the most scenic water falls around Bangalore. The water falls is formed in the Arkavati river, just before it meets Cauvery river. The waterfalls is located in lush green environment, and en-route to the famous Sangama, Mekedatu. Last Sunday, 15th July, me and my friend were stumbling upon places to visit near Bengalore in bikes when we found Chunchi Falls. Without a second thought in mind we both headed straightly towards Kanakapura Road. 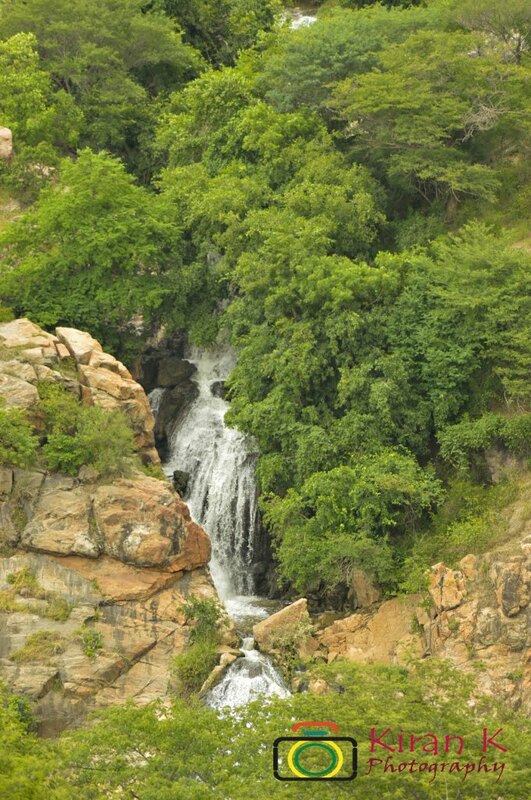 Upon reaching Kanakapura, one has to take the left road, the one towards Sangama, Mekedatu to reach Chunchi Falls. Upon traveling around 25kms from kanakapura, one can come across a entry collection checkpoint. Just after crossing the checkpoint, there lies a road on the left which would lead to Chunchi Falls. Though there's one more road to the left which is 2-4kms after the checkpoint, this road if taken will pass through farms, silk houses, giving a glimpse of local traditional life. Not more than 3-4km, the Chunchi falls parking lies on this road. 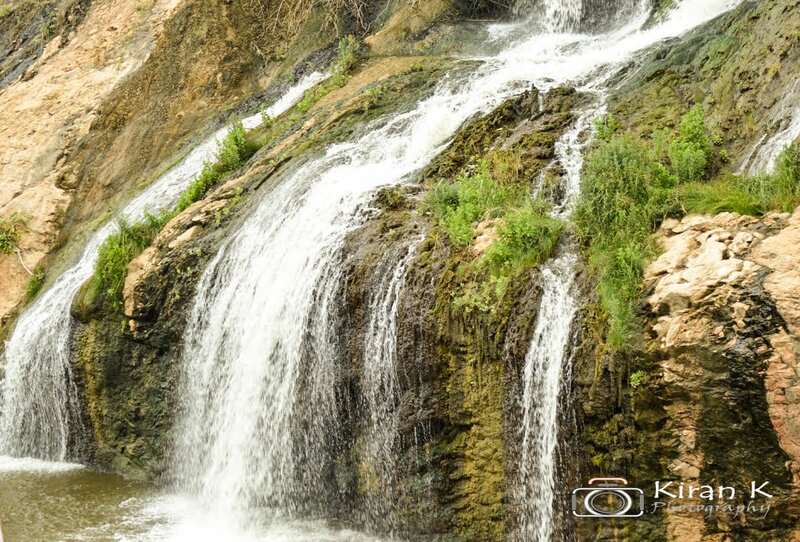 Chunchi Falls itself can be a place ideal for spending entire day with your loved ones. 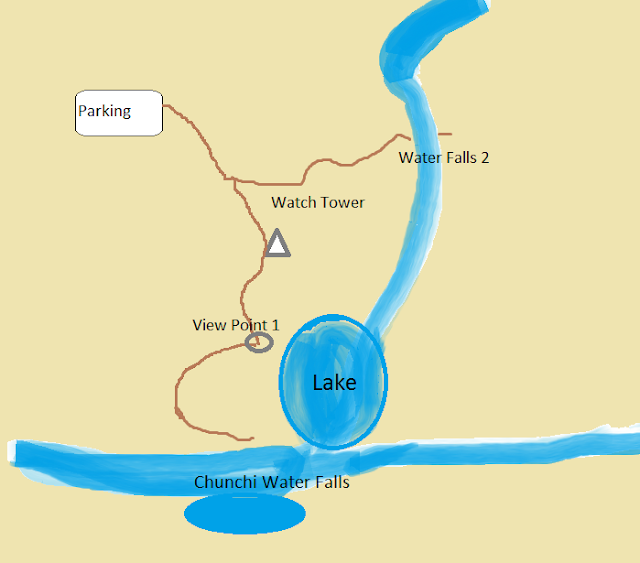 The place boasts of a lake, waterfalls, watch tower, rocks and what not. After parking the vehicles, one can usually see stalls selling edible items including water. From the parking one has to walk around 1km to reach the Watch tower. The watch tower provides a amazing panoramic view of the place. On to one side lies a water fall formed through the rocks, and on the distant other side lies this beautiful water falls near the lake. Further walking down the track towards the distant waterfalls, around another 1-2kms from here, one can reach the water falls base. The time we visited the water was quite fierce , but in season other than monsoon ,the water will be ideal to get into and enjoy under. From Chunchi falls we decided to go to our next place of visit. The next place was Mekedatu, via Sangama. 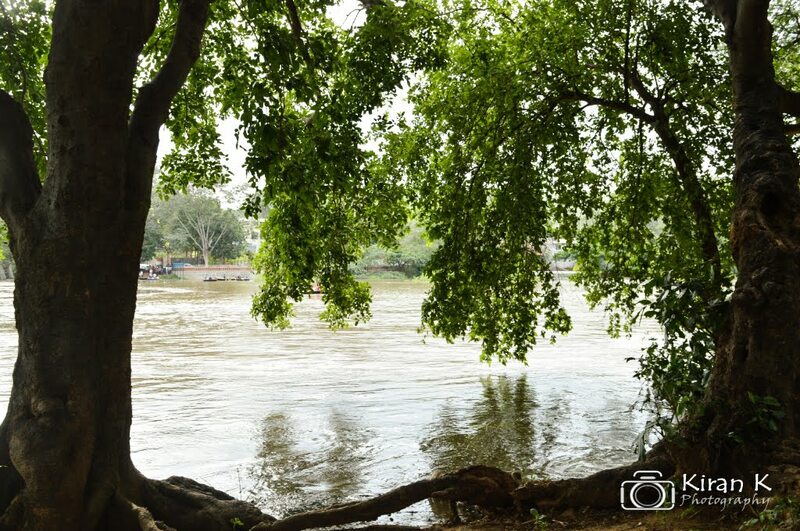 Sangama is the confluence of Cauvery and Arakavati. At Sangama, Cauvery River is very wide at the confluence, which is joined by Arkavati river. After the confluence, both the rivers merge together to head towards the common destination. But the river then flows through a narrow 5-10 meter gorge at Mekedatu . Mekedatu, in Kannada, refers to the goat leaping and crossing the river. Its said that there was a goat once, which was being chased by a tiger, and in order to survive the goat jumped cross the river and saved itself. 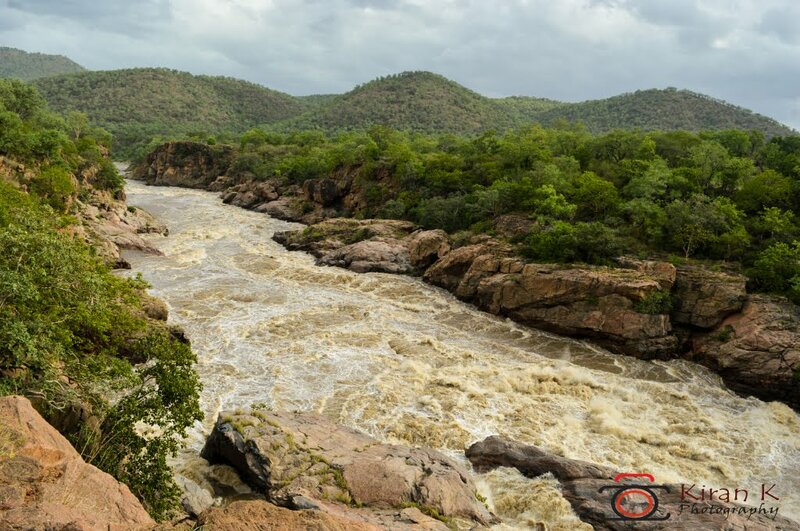 When reaching the gorge the river flows ferociously onto the rocks sculpting them into some amazing shapes. The water flow is very fierce at this place during monsoons making it very dangerous to swim here. After reaching Sangama, one has to cross the Arkavati river, which sometimes can be either by walking through or by coracles. Since it was monsoon, the water was quite full, and we had to take coracle ride. Upon reaching the other side of the river, one has to board the bus to reach Mekedatu. We were charged somewhere around 110Rs per person for both the coracle and the bus. Upon alighting down from the bus, one has to walk a little further till he find the small passage leading downstairs. But much to our dismay the place was closed, probably due to strong water current of the river in monsoon. Nevertheless, it was a amazing day, spent well amidst the nature in its pure form.